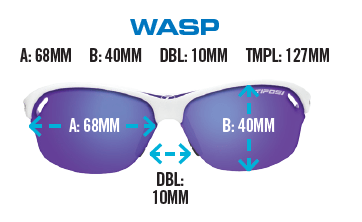 The new Wasp style from our Interchange collection is sleek and offers maximum visibility. Interchange options make it perfect for multiple activities. Made of Grilamid TR 90, a homopolyamide nylon characterized by an extremely high alternative bending strength, low density, and high resistance to chemical and UV damage. Hydrophilic rubber ear and nose pieces for a no-slip fit. Adjustable ear and nose pieces for a customizable, comfortable fit. Vented lenses improve air circulation, prevent fogging. All Tifosi Optics eyewear provides 100% protection from harmful UVA/UVB rays. Note: Non-prescription lenses do not come with prescription package. Available with authentic Tifosi brand prescription lenses (manufacturer direct). Available in prescription range of +3.00 to -3.00 with maximum of 2.00 cylinder. Progressive lenses not available. Prices quoted for Tifosi made lenses. Lenses can also be made with ASFE lab including bifocals and progressives (8 base curve charge required). See see prescription lens options page for all lens options. Estimated processing time: 2 weeks.